Marilyn Manson Straitjacket Modified Human Restraint Jacket- Size Large This jacket was purchased from the Marilyn Manson Museum. It was from Ginger Fish's personal collection. They tell me, "this is a very rare item since there was only five of them made. 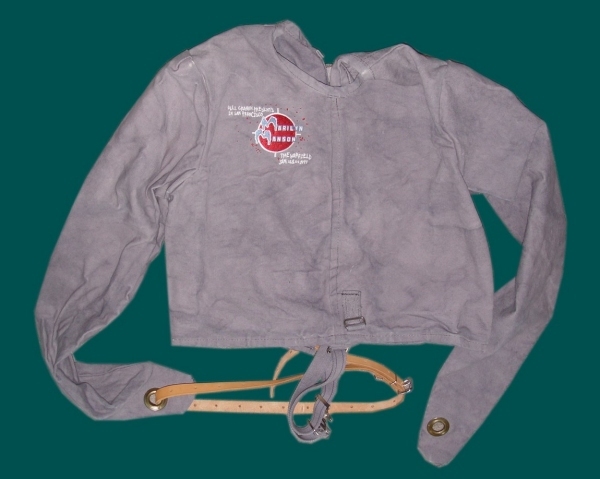 The promoter of a Marilyn Manson concert, Bill Graham, had these straight jackets made, one for each member in the band. The concert was a two night event on January 21st and 22nd at The Warfield in San Francisco." 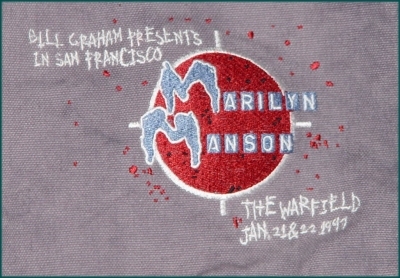 The jacket is a Humane Restraint jacket that has been died gray and embroidered on the front "Bill Graham Presents, In San Francisco, Marilyn Manson, The Warfield, Jan. 21 & 22 1997".